Starting in 2014, Effingut Brewerkz has brought its passion for great beer and its love of experimentation together to create legendary craft beers. Located at 5 locations accross Pune & Mumbai. 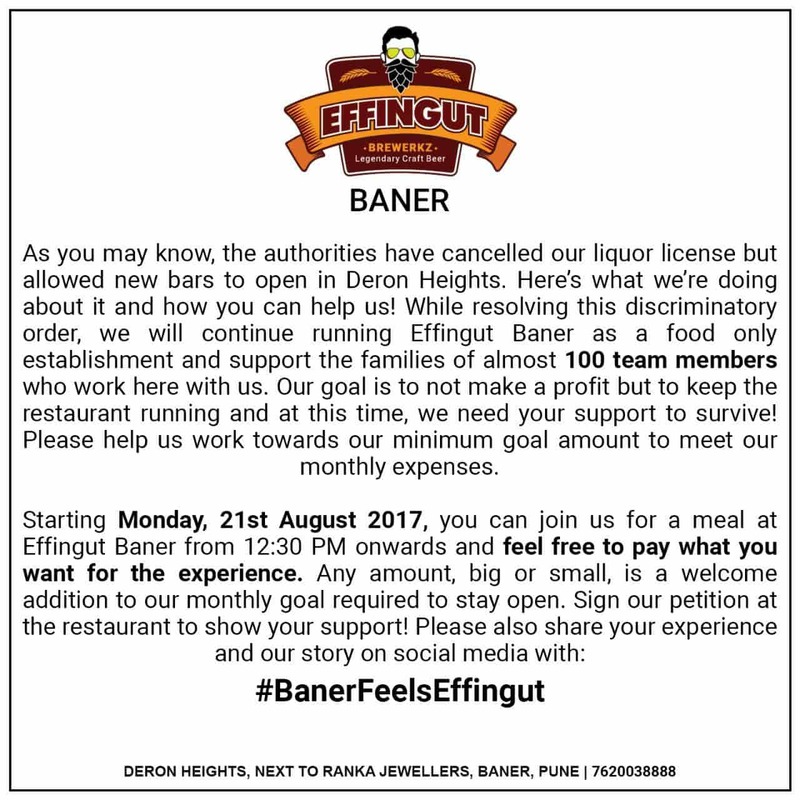 In Pune you can find Effingut at - Koregaon Park, Baner and Kharadi & In Mumbai - Colaba and Bandra. The driving ethos for Effingut is to create food and beer that venture away from the routine and conventional. To this end, there are always 8-10 beers on tap giving us plenty of opportunity to not just create beers that you love, but also those that introduce you to new styles from around the world. Firmly rooted in our heritage, some recipes use local ingredients to highlight Indian flavours for the local palate. Our beers, ciders and meads will always be fresh, hand crafted and with no preservatives, chemicals or artificial additives. Food is an equally important part of the Effingut experience – choose a complementary food pairing from our expansive multicuisine menu or go crazy with a contrasting one! There are a variety of Indian, Oriental, and Continental dishes that you can choose from to complement the artisanal beer. So come on over - join us for a pint or couple it with one of our popular theme nights. Enjoy our signature dishes and tell us what you liked best with your beer. Have fun, taste the difference and discover craft beer along the way! Traditional unfiltered Bavarian wheat beer with flavours of banana and cloves with a hint of bubblegum. Our in house recipe developed on the traditional English Cider, it is well carbonated and refreshing. What better way to bring in the summer than with our new Mango Chilli Cider? Made with organic mango pulp and fresh jalapeños, on tap now! The newest addition to our family, sweetness from the strawberry is married to the tart apple character. A Melomel is a mead made with the addition of fruits. Subtle notes of honey and peach sweetness are balanced with the zing of ginger on the aftertaste. A light copper coloured clear ale with moderate hop bitterness that balances maltiness with fruity notes from the hops. This is an easy drinking and sessionable beer. An easy drinking ale that's clean and crisp with hoppy and fruity notes on the aftertaste. Enjoy! An unfiltered, darker German wheat beer with lighter banana and cloves that are balanced with a malty richness. Electrify your senses this summer with the Indian Brown Ale, now on tap! Woody and earthy notes give way to a rich roastiness with moderate bitterness. Enjoy! A strong, potent brew that is a balance of part malt-based ale and part honey-based mead. Aged for months, there is a hop presence but the organic honey gives it a unique floral aroma. This brew signals the arrival of the holidays at Effingut! A study in hop additions, this India Pale Ale has citrus notes from American hops and fruity and herbal notes from Japanese hops! A beer to savour. Made with Lactose (a milk product) and served on Nitrogen for an extra smooth mouthfeel, the Milk Stout is chocolate and roasty with a hint of sweetness! Keep an eye out for the beautiful nitrogen cascade when it is poured. Download the Effingut mobile app and register to join our Loyalty programme now! We'll keep you posted about the latest at Effingut. We promise not to spam! 2019 © Effingut Brewerkz. Powered by Autuskey.